An ‘erratic’ driver who was suffering from a stroke was ‘pulled over and assaulted’ by a motorcyclist on the M25. Surrey Police responded to reports of a suspected drunk driver at around 10.15am on Saturday (November 24). Officers say the man from Hemel Hempstead started driving erratically and hit several cars as he careered towards the hard shoulder between junction 13 to 14. After crashing into the hard shoulder, drivers restrained him and a passing motorcyclist punched him and drove off. It was only when emergency services arrived that they realised he was having a stroke. The man was taken to St Peter’s Hospital in Chertsey for treatment, where he remains. 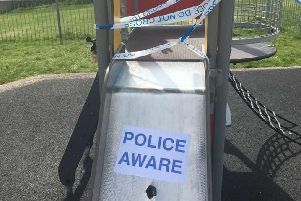 A spokesman for Surrey Police said: “It soon became apparent that the driver, a man in his 40s, had suffered a medical episode. He is still in hospital receiving treatment. “Before emergency services were on scene, a motorcyclist pulled over and assaulted the driver before leaving. Officers are particularly keen to trace the drivers of a green Mini and an airport taxi who stopped at the scene of the collision.